KUMO routers provide a convenient dense routing solution in lightweight form factors for use in facilities, OB trucks, post suites and more. 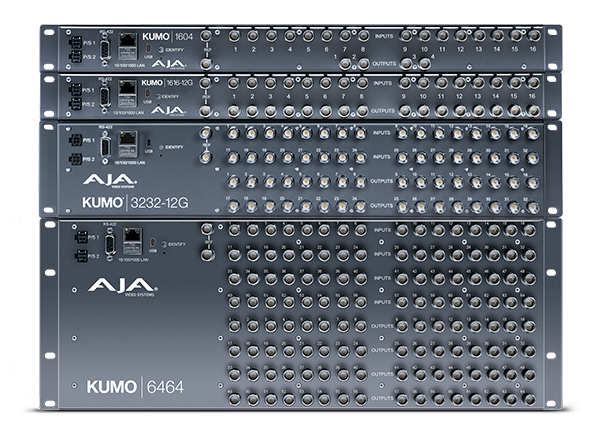 KUMO is available in multiple connector densities, in 3G-SDI and 12G-SDI options. KUMO is easy to update, configure, and control with optional Control Panels for quick physical access for source and destination routing, with convenient USB ports, plus all models offer integrated web browser access across a network over the built in Ethernet connections. The new KUMO 1616-12G and KUMO 3232-12G routers enable full range of 4K and UltraHD routing on single BNC for rates up to 12G. With a simple setting change, KUMO 3G routers can be configured for ganged dual and quad port routing, allowing users to group together multiple inputs and outputs for dual-link, 4K/UltraHD, and even 8K workflows. 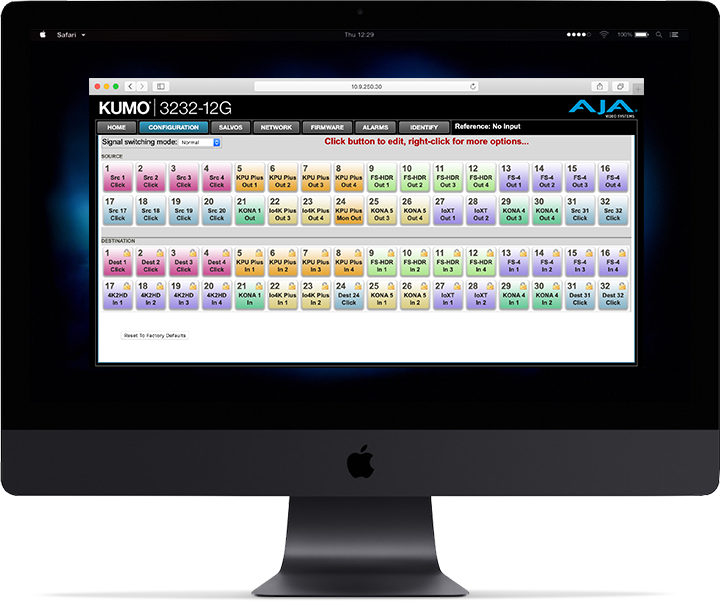 KUMO supports routing of uncompressed or raw 8K/4K/UltraHD/2K/HD/SD signals throughout a production or post facility, giving you the flexibility to route virtually any format. 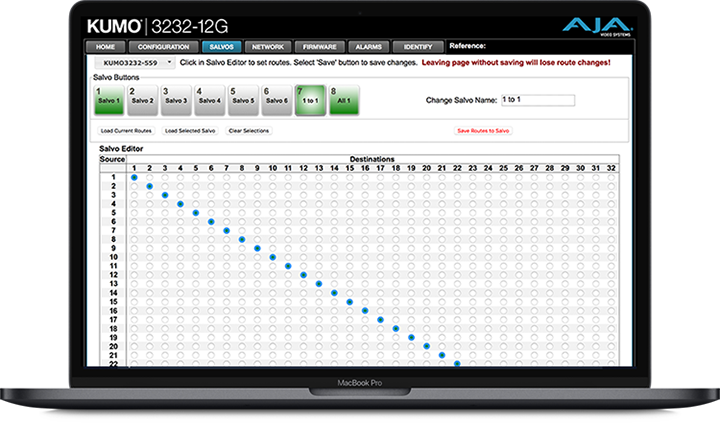 Salvos support simplifies switching operations by recalling multiple sources to specific destinations,allowing the operator to quickly recall predefined sources to specific destinations configurations with a simple button press. Salvos are stored in a KUMO router and can be recalled via the KUMO router’s Web UI, GVG Native Protocol over Ethernet, RS-232, and/or the AJA KUMO CP2 Salvos buttons. Eight Salvos can be configured and stored in each KUMO router. KUMO compact SDI routers provide powerful signal control and support full broadcast specifications over 12G-SDI, 6G-SDI, 3G-SDI, HD-SDI and SD-SDI, with quality that exceeds SMPTE specifications. The super-compact 1RU and 2RU and 4RU formats are just a few inches deep, making them a perfect fit for any broadcast, production, or post-production environment, from mobile sports trucks and edit suites, to corporate video installations or live theatrical A/V rigs. Routing sits at the heart of your signal matrix needs. To ensure always up reliability, KUMO offers redundant power supply options for the utmost confidence.